More Dating? Only if it's the right kind. We need more dating, but of the right kind at the right time. More of the wrong kind of dating isn’t going to get you more dates, help you get married, strengthen your relationships, or change the dating culture. It’ll just frustrate you. There are two general types of dates that are necessary in order to get and stay happily married. These dates differ in purpose and format, but both are super important. One is not better or less than the other, there is simply a time and place for each. Whether or not your dating will be effective depends largely on when and how you choose to date. Below I will describe each type of date, including when and why you would use each. 1- This type of date requires minimal emotional, physical, and financial investment. Therefore, these dates are inherently low risk. Less risk = more dates. More dates = better chance at establishing a healthy relationship. 2- This type of date should help you relax and be yourself. This will make you appear more attractive to anyone you go out with. 3- Because this type of date is primarily to have fun (and not to immediately determine whether or not someone is “marriage material”), guys or girls should feel more confidence in asking people out on #justadate (even those they consider “out of their league”). 4- Because this type of date is simple and fun and not meant to express a significant romantic interest, girls or guys should be more willing and comfortable to say yes to these types of dates, even multiple dates with the same person. #justadates are not only important in the beginning phase of a relationship. Married couples, particularly those with children, can maintain a high level of loving feelings through a steady stream of simple, fun dates. Not everyone has time for regular elaborate, time-consuming dates. However, everyone can make time for #justadate. If you don't know how to #justadate, you can learn how to do that here. 1- Once people start dating exclusively, the mind naturally begins to disengage from the learning process. Generally speaking, this happens because we assume we know more about our romantic partner than we really do. That is a dangerous assumption to have when you are choosing a spouse. Dating for depth helps keep the mind engaged and aware. 2- In choosing a mate wisely, if we are in love, we may be up against biology. Researchers have found that “feelings of love lead to a suppression of activity in the areas of the brain controlling critical thought. It seems that once we get close to a person, the brain decides the need to assess their character and personality is reduced.” Dating for depth can help us be sure that we are using our head in choosing a mate. 3- One of the key purposes of dating is to create realistic expectations for marriage. Going on a #deepdate leads to more learning and knowing. The more we learn about a prospective spouse, the more realistic our expectations will be. This can help smooth out a potentially bumpy transition into marriage. This is true even for those who know (spiritually or otherwise) they are going to marry their partner. 4- Establishing a pattern of deep dating before you get married will require a lot of effort, because you will have to be more intentional in your relationship. 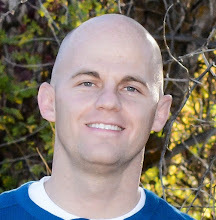 This effort will prepare you to be an intentional partner who continues to date his or her spouse, even after the novelty of marriage has worn off. In marriage, especially after the kids come along, dating won’t happen unless you are intentional. Deep dates may be longer and typically require more time and energy to plan and perform. Often times, you will plan a date with a specific purpose in mind. For example, because I want to know how well my girlfriend handles stress, fatigue and the outdoors, I am going to take her out on an all-day hike in the Tetons. Or, a married couple might plan a date with the purpose of rekindling their love and connection by recreating the first date they ever went on with each other, spending time talking about how they met and what they've been through together. 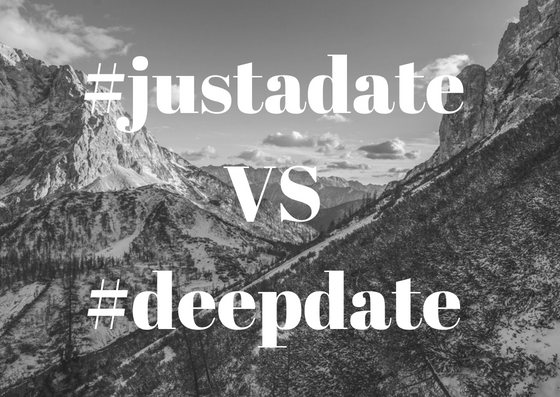 Both of these dates may require more time and planning, but there is a greater opportunity for learning and connection than what you would experience in #justadate. To get and stay happily married, you need both types of dates. Until you are dating exclusively, focus on the simple, fun dates. Remember, it's #justadate. Going on a #deepdates when you first meet someone can send the wrong message and ruin the chance at a subsequent date. While you are dating seriously and engaged, make sure you are dating with depth. If you date just for fun during this relationship stage, you'll miss opportunities to grow closer together and learn important things about one another. After you are married, make sure you have a steady dose of simple and fun dates. Occasionally, dig a bit deeper and spend more time planning a more intentional, deep date. Stay tuned for specific ideas for both types of dates!